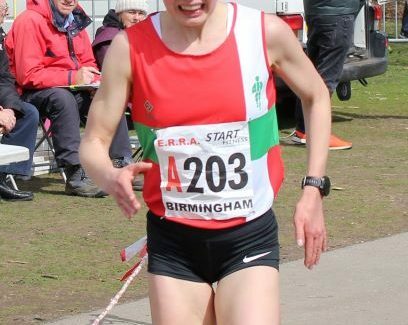 Danish runner Anna Moller made her debut for Aldershot Farnham & District on Saturday. 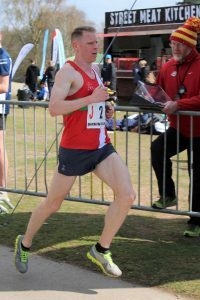 The European under-23 cross country champion, who was fifteenth (first non African) in the senior race at the World championships in Denmark a week earlier, led the field on the initial leg of the National 6 Stage Road Relay at Sutton Coldfield, finishing six seconds before Jess Judd of Blackburn Harriers, the 2017 English champion. These two and Hayley Carruthers of Birchfield Harriers, who was third, turned out to be the day’s three fastest for the longer stage. Fourth fastest was Louise Small who returned AFD to second place on the fourth leg. 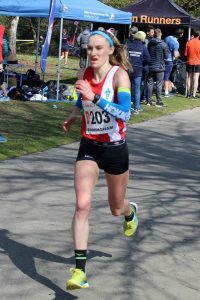 Emma Stevens had been passed by Birchfield’s Georgie Hartigan and Bronwen Owen of Leeds City, the latter recording the second fastest time of the day for the shorter stage. Katie Hughes was overtaken by the athlete who recorded the fastest, Katie Snowden of Herne hill Harriers, a finalist over 1500 metres at last year’s Commonwealth Games. On the penultimate stage, AFD’s Emily Wicks lost second to Herne Hill’s Olivia Stillman, tenth fastest overall for the short stage, and, clocking equal seventh fastest, Birchfield’s Bryony Gunn relegated Katriona Brown to fourth, less than half a minute away from the bronze medals. AFD’s men did take the bronze medals in the men’s 12-stage event. After legs by Harvey Dixon, Ben Bradley, Luke Prior, Jack Boswell, Ellis Cross and Phil Sewell, they were in ninth. Olympian Andy Vernon promoted the side to fourth before Alex Pointon and Richard Allen each gained a place. Sam Eglen, Ricky Harvie and Max Heyden ensured that their club stayed in the medals. There were more medals for AFD in the youngsters’ five kilometre races held at the beginning of the meeting. Ryan Martin led the u15 boys to gold with an individual win. 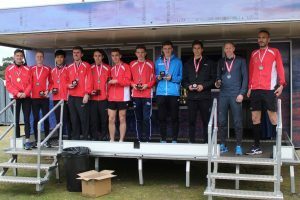 Charlie Wagstaff was second, beating Rushcliffe’s James Wardle who was fastest in the age group relays at the same venue in October. AFD’s trio was completed by Woody Jerome in fifth. Individual silver medallist Pippa Roessler led Rachel Gillett, fourth, and Niamh McLoughlin, seventh, to victory in the u15 girls’ competition. Luke van Oodtshoorn took a bronze medal in the u17 men’s contest.